JK Rear Crusher Flares are now available in aluminum! (Click Here for the steel version). These aluminum Crusher Flares are light weight—at only 9.6 lbs. per fender—yet durable. Like in the front, the original equipment rear flares are flimsy plastic which can tear off and are easily damaged on the trail. Poison Spyder's Aluminum Rear Crusher Flares™ for JK are precision-fabricated replacements that are light weight and built to handle moderate trail abuse. This product ships as bare aluminum—it will need to be painted or powder coated prior to final installation. We do not offer a powder coat option for this item. The Poison Spyder JK Crusher Flare™ provides tire coverage for up to a 40" tire (minor trimming of the inner sheetmetal may be required for tire clearance). The Crusher Flare's™ mounting plate is made of CNC laser cut 3/16" thick aluminum plate that has been brake-formed to fit the contours of the JK's flare mounting surface like a glove. The Crusher Flare™ rails are CNC-bent 1.5" X .199 wall annealed aluminum structural tubing, with a fender surface made of 1/8" laser-cut aluminum plate. The Crusher Flare™ mounts using stainless steel countersunk flat head cap screws that provide a low profile, great looks and corrosion resistance. Installation requires drilling and installation of the provided nut-sert fasteners. Poison Spyder supplies a simple nut-sert installation tool to facilitate the process. Crusher Flares™ are sold bare, un-coated. For added structural rigidity, Rear Crusher Flares™ come with a 4-piece Inner Brace Kit. The Inner Braces are engineered to provide the internal structure to keep the Crusher Flares™ from deforming the Jeep's outer tub sheetmetal on impacts. 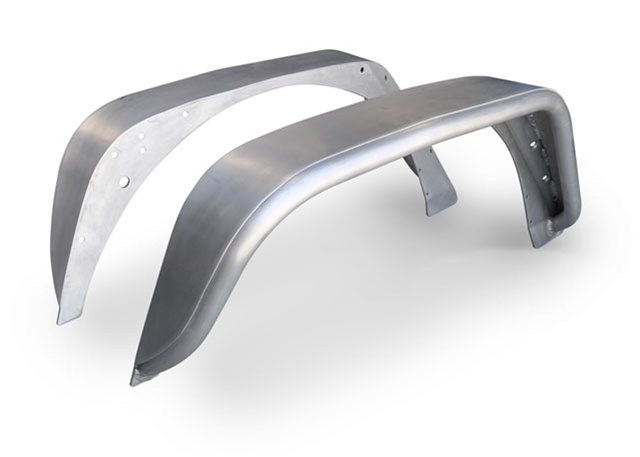 The components are laser-cut and brake-formed to precisely fit between the Jeep's outer sheetmetal and the heavier gauge steel of the structural inner tub. The result is a Crusher Flare™ installation that will withstand serious hits from the rocks. The .188 wall tubing and Inner Braces yield a lightweight aluminum flare that is stronger than any other aluminum flare on the market, and even stronger than steel flares that are not internally braced. Not sure whether to choose steel or aluminum for your Crusher Flares? Aluminum is lighter in weight, so might be the best choice for those looking to save weight on their heavy JK's in order to improve fuel mileage and gain an advantage off-road. However, when wheeling with aluminum flares it is up to the driver to use more care and finesse, as the aluminum components are not going to be able to withstand the same direct impacts that steel can. The outer tube on our aluminum Crusher Flares is beefy .188" wall thickness. Compared to our steel Crusher Flares which use .120" wall DOM steel tubing. The thicker tube wall recoups some of the strength lost by going to aluminum, however the steel versions will still be stronger in a direct impact with the rocks. For reference, a steel JK Front Crusher Flare weighs 24.2 lbs (not including hardware), while an aluminum one weighs only 9.6 lbs. Which is best for you will depend on your particular intended use of the Jeep, driving style and other factors. NOTE: Aluminum JK Crusher Flares DO NOT include a laser-etched Spyder logo along the lower edge. That feature is included on steel versions only. Photos in the gallery that depict the laser-etched Spyder are of the steel version of the Crusher Flare. The JK Rear Crusher Flare™ Kit comes standard with mounting provisions to place a small 3/4" LED marker lamp inside the flare just rearward of the tire. The LED can be wired in to the Jeep's running lights or turn signal circuits. 3/4" amber LED lamps are available separately from Poison Spyder. These look fantastic painted purple on my purple 2017 JKU! Great flares! Please fix instruction illustrations. The fit and style is excellent. The rough orbital sanded finish was a disappointment. Due to the deep scratches the powder coating did not come out as nice as my previous steel fenders. The customer service and sales staff are top notch.